William Steig, famed American cartoonist and illustrator, created this illustration for inclusion in the 1941 book, Winter Soldiers: The Story of a Conspiracy Against Schools. 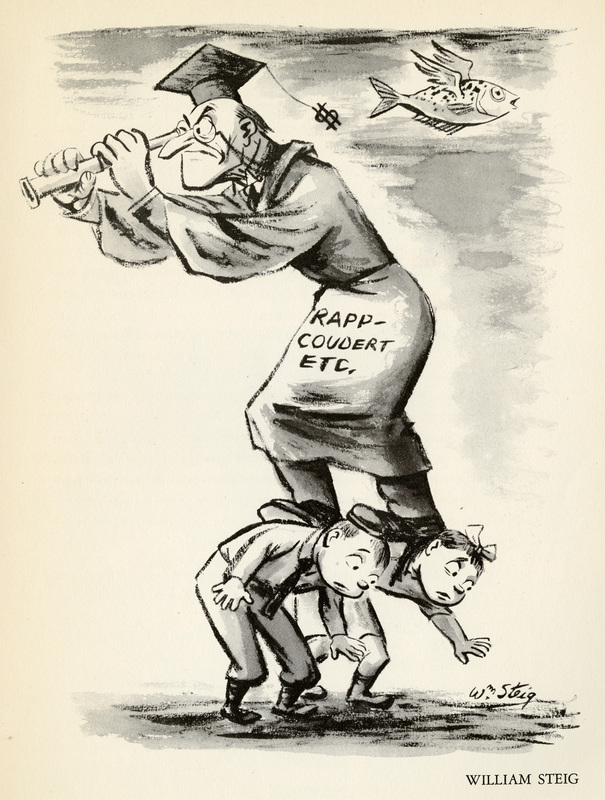 The book, published by the Committee for Defense of Public Education, tells the story of the Rapp-Coudert hearings and New York State’s efforts to rid its public schools and colleges of "subversive influences" and persons, particularly those with communist ties. A representative of those efforts can be seen in this image standing on the backs of schoolchildren. Cite This document | Steig, William, “Winter Soldiers, Selection #1: William Steig,” CUNY Digital History Archive, accessed April 19, 2019, http://cdha.cuny.edu/items/show/5242.